Every now and then I keep wondering how India’s position in the World could have got stronger on various counts, if the partition of 1947 and the war of 1971 had not happened. I know it’s easy to imagine but not all that simple in reality, but can you imagine the prospects if Pakistan, Bangladesh and India were to remain united as one single Nation? Be it in politics, sports, international affairs, commerce and more, we would certainly be looked upon with far more respect by the rest of the World. There’s another strong reason for me to feel so, if not for the political and religious divide that set in post 1947, I strongly believe that there isn’t much of a difference between people on the either side of the border. Artists of Pakistan continue to be popular in India, while Hindi films are enjoying terrific patronage in Pakistan. The cultural synergy between West Bengal and East Bengal i.e Bangladesh is still very much on display, what with the language and love for literature and music remaining intact on either side of the border. Despite all the political turbulence in Bangladesh it remains a fact that even today Bengalis on either sides of the border still long for the days of the past when they did not have to get uprooted from their original place of stay due to reasons beyond their control. Watching Goutam Ghose‘s recent Bengali film Shankhachil (Boundless) only reignited these thoughts in my mind altogether again. 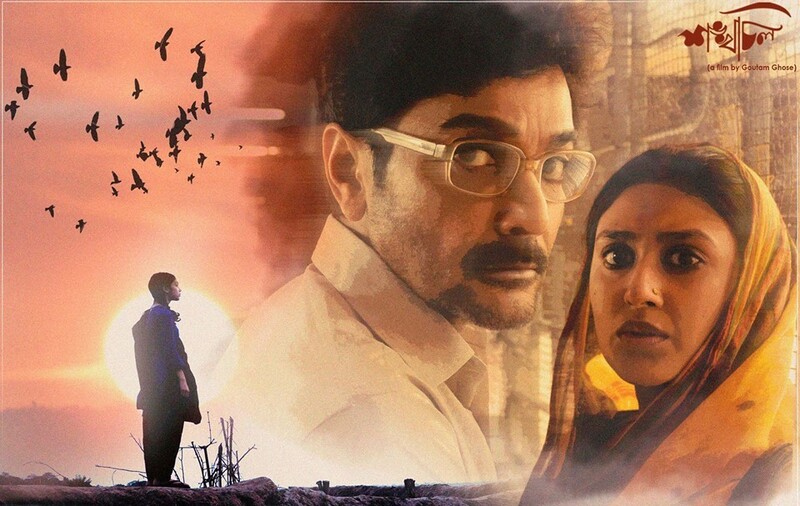 Before going on to share my take on the film it is interesting to note that this is an India-Bangladesh co-production film, with popular Bengali actor Prosenjit playing the lead role and even being one of the producers of the film. Shankhachil happens to be the 3rd India-Bangladesh co-production film made by Goutam Ghose, after Padma Nadir Majhi (1992) and Moner Manush (2010). It’s also interesting to note that Prosenjit by now has come a long way in his acting career, having successfully managed to move from regular potboilers to movies of substance. In the process he has managed to extend his shelf life as well in a unique fashion. 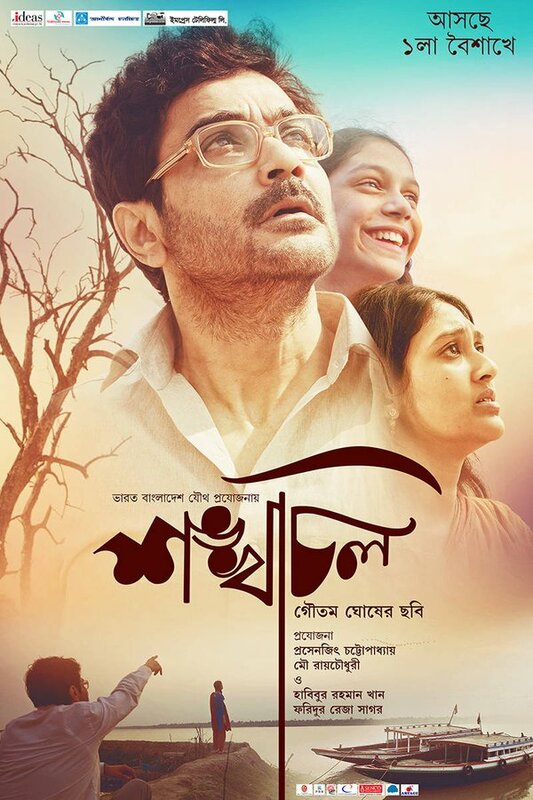 Having bagged the National Award for Best Bengali Film and with the previous outing of Goutam Ghose and Prosenjit being successful (Moner Manush), I was quite looking forward to Shankhachil, released rightly for Poila Baisakh this time. The film starts by talking about illegal immigration of Bangladeshis into India and the sensitive topic of the bifurcation of Bengal as we witness the farcical nature of the boundary, sometimes dividing people in the same village as well into people of the 2 countries. However this is more a preamble of sorts and the film isn’t an attempt at addressing the larger topic of illegal immigration. It’s actually an endeavour to showcase upon one individual and his family, living close to the India-Bangladesh border and leading a contented life in their own way until fate turns things around for them in a way that they had never thought of. Muntashir Choudhary Badal (Prosenjit) is a school teacher who lives with his wife Laila Chowdhury (Kusum Sikder) and daughter Roopsha (Shajbati) and they are happy in their own space. The father and daughter special share a special bond as Badal clearly thinks that his inquisitive daughter is quite special in a way. Things take a serious turn when Roopsha falls ill and the parents find out that she has a serious heart ailment. With the situation requiring urgent medical attention, Badal has no better option other than entering India (they just have to cross the river) in a clandestine fashion. Out there at the border town of Taki, Badal finds out to his dismay that the congenital heart disorder can only be cured by a surgery which needs to be done in Kolkata. Encouraged by a local guardian (Dipankar Dey) Badal moves ahead with his family to Kolkata, having to depend upon a false identity to ensure that everything goes smooth. While Badal gives in and assumes the identity of an Indian Hindu citizen, the turmoil in him starts taking a toll on him soon. Be it in Taki or in Kolkata there is nothing to convey the feeling of being in an alien land, so why can’t he just be considered as a Bengali? Why does his daughter’s treatment hinge upon his false identity including lying about his religion? Are our borders so stringent that even humanitarian grounds find no support? Goutam Ghose has taken upon a theme that most Bengalis can relate to. When Badal laments about why he cannot be accepted simply as a Bengali and why is there a need for anything beyond it, it is easy to identify with his anguish. The choice of locations deserves a big thumbs up, the village in Bangladesh and the town of Taki in West Bengal appear just an extension of each other, the similarity is quite stark in a way. The Ichamati River appears as a motif in the film, often alluding to how close yet how far the two countries are, divided in a way that is beyond anyone’s control. Certain moments in the film stay with you long after you’ve seen it, like the scene towards the end of the film when one of Badal’s well wishers complains to a Bangladeshi Hindu that he should have gone back to India since his allegiance is with India and not Bangladesh, the pain on the other person’s face as he replies saying where else will he go when this is home is quite a poignant moment. The interactions between Roopsha and the BSF soldier (Nakul Vaid) are also quite humane, portraying that while borders may divide us, we still remain united in spirit. Ishaan Ghose‘s cinematography is quite effective, bringing alive the scenic beauty of the locations in a way that it doesn’t look like a tourism showreel and giving it the sense of despair in a subtle manner. Goutam Ghose’s music works quite well with the mood of the film, conveying the spirit effectively. The film has some really good actors from both India and Bangladesh, most of them fitting into their characters well. Priyanshu Chatterjee and Nakul Vaid play the senior BSF officer and the BSF soldier respectively, lending an outsider’s touch to the tale. Dipankar Dey once again is effective, playing the crucial role of the local guardian of sorts to Badal and his family. Ushasie Chakraborty as the sympathetic hospital PRO plays her part with grace, while I did initially fear that there could be an unnecessary angle of the hospital fleecing Badal in an attempt to make money etc, thankfully Gautam Ghose steers clear of that angle completely. Shajbati makes a good entry to films, she comes across very natural as a curious, fun loving child who is keen to know everything around her. Kusum Sikder as Laila leaves an impact as well, her anguish over having to pass off as a Hindu after crossing over to India appears quite genuine. If the film has any rough edges then I would say that the difficulties faced by Badal and Laila could have been portrayed in a slightly better manner. Sure there is the portion where Badal is caught in a dilemma as he has to raise funds for the surgery and ends up unfortunately going through a bad situation in the market place when he tries to sell off Laila’s jewels, but otherwise there could have been ways to look at making a better impact. Also the ending as such comes across as a little hurried up, almost as if Goutam Ghose wanted to suddenly bring in a culmination and move on. Which brings me to Prosenjit Chatterjee, the leading man of the film and perhaps one of the valid reasons for watching Shankachil. It is heartening to see him ensure that we only see the actor in him and not the star, like for instance even as he is beaten up by a man on the street and falls on the ground, he remains there on the ground and doesn’t retaliate. Also in terms of portraying the dilemma over having to change or mask his identity in India is something that he handles with a lot of care and grace. With Shankhachil Gautam Ghose addresses an important topic, a topic that one can identify with very well. 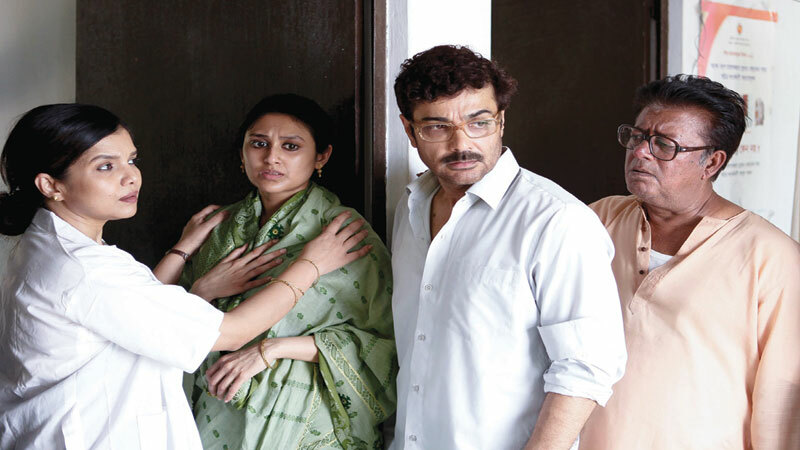 It also sees Prosenjit putting up a bravura performance which makes the film quite relevant to watch. Note: Shankachil is now on to its successful 3rd week in West Bengal and Bangladesh and has just completed its 2 week run in cities like Mumbai, Pune, Delhi/NCR and Bangalore.